Party Hard 2 is, as I hope you will have guessed, the sequel to the original Party Hard having been developed by the same team (Pinokl Games) and the same publisher (Tiny Build). The core gameplay is much the same as the original; you infiltrate a party in progress and start murdering people. There are some significant changes though which make the sequel feel quite distinct, most noticeably the artistic change to use a 3D gameworld while retaining 2D sprites for the characters. As of now there’s not much to say on the storyline for the game, beyond the fact that you’re not playing as the protagonist from the first game. Instead of being motivated by rage, over being kept away by partygoers, you’re instead denied your Christmas bonus and decide to start murdering people. 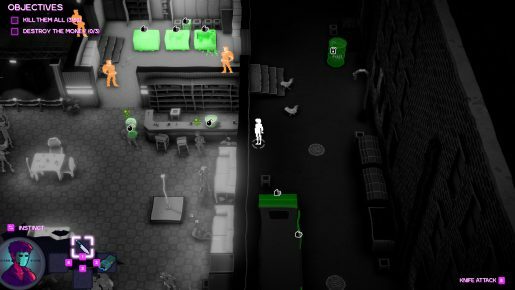 The game has had an interesting development period, with early alphas diverging from the first game by changing the objective: you weren’t looking to simply kill everyone at the party, instead having a list of targets in each location (normally drug dealers, sorters or similarly nefarious individuals). The current alpha returns to the objective of murdering everyone at the party though, which means you’re going to be spending a lot more time in each level, and emphasises large (often explosive) methods to take care of lots of partygoers at once. Whether the lists of specific targets will return in the full game once it’s released remains to be seen, but personally I hope for a mixture of objective styles for the sake of variety. In terms of weaponry you have only a knife, but you also have special ability which enables you to instantly kill people in a small radius. This feels a little incongruous next to the otherwise fairly realistic methods you can use to dispatch targets, but gives you an extra option if you screw up (which is likely) so isn’t entirely unwelcome. You can also pick up new weapons including grenades which you might be able to loot from bikers or find in the level. One of the most important methods for dispatching people is sabotaging objects, perhaps to electrocute whoever uses it, set up explosions or poison drinks. Performing these actions is very simple; in most cases you just go up to an object and press a button to sabotage it, possibly requiring you to have picked up an object previously like poison if you want to poison a drink. 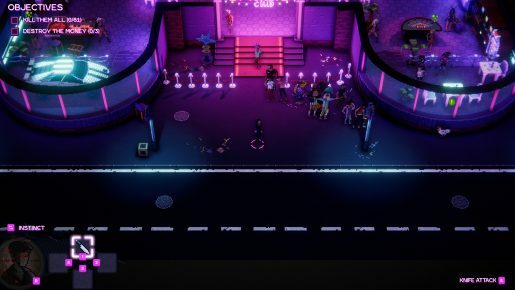 The difficulty in Party Hard 2 is in performing your assassinations while managing the huge number of potential witnesses. When someone does see you doing something shady they will take the obvious step of phoning the police which causes you all manner of difficulties. It’s not game over when the police arrive though – people who have actually witnessed your actions will be marked and only these people can identify you, giving you the opportunity to continue albeit with some increased difficulty. The police will be called to investigate bodies and then medics will arrive to take the bodies away which is both interesting to watch and means there are a few more potential witnesses around. In the current alpha there is a fixed level design with some procedural elements, notably the type of interact-able object in a given location. On one run there might be a couple of water coolers in the kitchen, on another there might only be lots of ovens. This is important as you can’t rely on a single approach to get you through every attempt, particularly when it comes to causing chain reactions. The simplest form of this would be something like setting a trail of petrol between an oven and an oil barrel, so that when the oven explodes due to sabotage you get a large fire and explosion as a bonus. Using these interactions is the most engaging part of the game, working out how you can best use the environment to get your grim task completed. 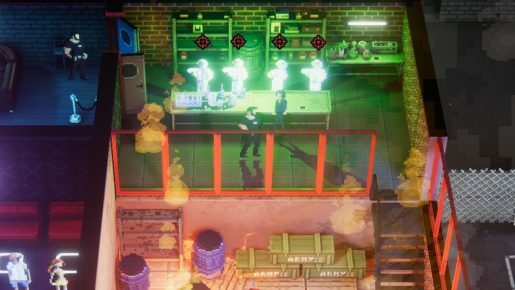 Overall the gameplay shakes out as a blend of stealth and puzzle game, requiring you to observe, plan and then execute it to execute your targets. The top-down perspective reinforces the feeling of solving a puzzle, and keeps you detached from the pretty heinous activities you get involved in. Helping you to see what you can interact with and the location of guards in instinct mode, which is a pretty standard special sense mode which has appeared in many games. This is very useful as the art is quite busy and you can easily lose track of what’s going on otherwise. As you’d hope for from a game which involves spending time at parties there’s an excellent soundtrack of pulsing synth and dance music, which somehow manages to not get irritating. Party Hard 2 is an interesting game which offers some nice enhancements over the original game but is effectively more of the same. If you like stealth games and aren’t put off by the murderous theme then this might be a good fit for you. Party Hard 2 is currently available from the developer’s website, which gets you instant access to the alpha builds if you opt for the collector’s or deluxe editions. If you’re interested you can also try a couple of the earlier alpha builds which are available to download for free from the website. Party Hard 2 will also be available from Steam directly once the game releases.